A few months ago I came across my new favorite toy, the Crazyflie nano quadcopter. 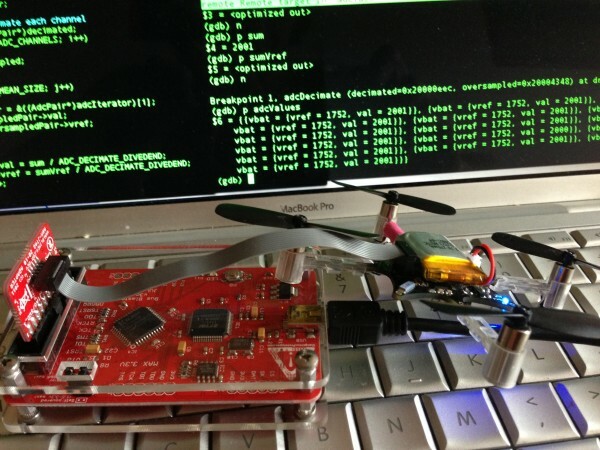 Developed by Bitcraze, the Crazyflie is an open source firmware and hardware flying development board. With a relatively beefy STM32 ARM Cortext-M3 MCU and an expansion header the Crazyflie is an ideal candidate for upgrades and modifications. With such expandability, spare CPU cycles and RAM, it should be possible to interface the Crazyflie with the sensors necessary to facilitate autonomous flight and abiotic variable detection. Given the extremely flexible mobility of the Crazyflie, these variables can be detected nearly anywhere in space. This entry was posted on Wednesday, July 31st, 2013 at 11:00 am	and is filed under Bus Blaster. You can follow any responses to this entry through the RSS 2.0 feed. You can skip to the end and leave a response. Pinging is currently not allowed. Where did you get the JTAG board? please explain your setup. thanks. It is written on it and you can read it in the big version of the photo at the site. It is a Olimex ARM-JTAG-20-10. Thanks for the link but there was no way I could read it from the big version of the pic. The small converter JTAG board? I’ve got a bus blaster V4 but couldn’t figure out the pinout conversion to the mini 10.